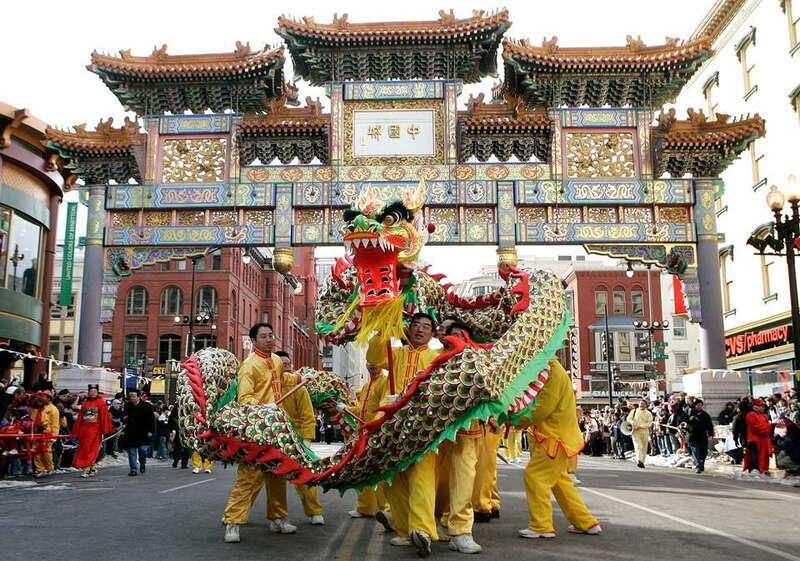 Washington, D.C. celebrates the Chinese New Year with a parade in Chinatown featuring traditional Chinese Dragon Dance, Kung Fu demonstrations, and live musical entertainment. The parade is a colorful celebration of Chinese culture. A wide variety of cultural and community organizations participate in the Washington, D.C. Chinese New Year Parade. Many members of the Chinese community participate. The Chinese animal signs represent a cyclical concept of time, a 12-year cycle used for dating the years. Date and Time: Sunday, February 10, 2019, 2:00 - 4:00 p.m. The parade is 50 minutes long, and this year there will be a pre-parade dance party at 7th & H Streets at 1 p.m. Location: Chinatown - on H Street, NW, Washington, D.C. between 6th and 8th Streets. The parade winds around the adjoining streets. A good place to view the parade is along 7th St., away from the largest crowds at 6th & H Streets. The closest Metro station is Gallery Place/Chinatown. See a map. Driving Directions: From I-395 North: Take the 12th St exit, Merge onto 12th St SW, turn right at Constitution Ave NW/US-1, turn left at 6th St NW/US-1, and arrive in Chinatown. There is some street parking available in the area, but this is a busy part of town in the heart of the city and spaces fill up quickly. As many streets will be closed off for the parade, the best way to get to the area is to use public transportation. The Friendship Arch: A traditional Chinese gate, the Friendship Arch prominently marks the Chinatown neighborhood at H and 7th Streets. The Chinese New Year Parade is centered around this Washington, D.C. landmark. The small historic neighborhood is home to approximately 20 Chinese and Asian restaurants and a handful of other small businesses. Chinese Lions Dancing Along H Street: In China, the lion is regarded as the king of the forests and of the other animals. It has thus long been used as a symbol of power and grandeur. It is believed to offer protection from evil spirits. Marching Bands: Falun Gong, a Chinese spiritual organization, marches with red lacquered drums and red streamers. The Ballou High School Marching Band, the Marching Knights, participates. Children and Youth Groups: Children twirl diabolos, a kind of Chinese yo-yo, as they march in the new year parade. The Chinese Youth Club of Washington includes members from throughout the metropolitan area. The Dragon Dance: Dragons are an important symbol in the Chinese New Year traditions. The Dragon Dance is a favorite part of the annual celebration. Qilin: A Qilin is a mythical beast covered in fire that appears as sage to bring serenity and prosperity to all. Firecrackers: The Chinese New Year Parade ends with a bang with the lighting of a giant firecracker. Firecrackers are used because the word for firecrackers implies that everyone will be exploding or bursting with good fortune.